Michael Young, 37, finishes his career as a .300 hitter and a seven-time All-Star. Michael Young, the face of the Texas Rangers franchise for a decade, has opted to retire to spend time with his family despite having opportunities to play this season. Young spent the 2013 season playing for both the Philadelphia Phillies and Los Angeles Dodgers after getting traded to the Phillies last offseason. While he ended his playing career with the Dodgers, it was with the Rangers that he became one of the top hitters of his era. He will make his retirement official Friday during a press conference at Rangers Ballpark where he will retire as member of the Rangers. Young, 37, finishes his career as a .300 and a seven-time All-Star. He was traded to the Rangers during the 2000 season and was a starter for the next 12 seasons, helping the Rangers rise from the American League West cellar to an AL power. By the time he was traded to Philly, Young had become the Texas franchise leader in games, at-bats, runs scored, hits, doubles, triples and total bases. "He certainly was the face of the organization and he represented his community, organization and family with class," Texas manager Ron Washington said. "I certainly hate to see a guy of his status decide it’s time. The game of baseball will miss him. I know I will miss him. He meant a lot to me. He had the respect of his teammates and he led like a pro." Young is one of 16 players to have at least six seasons with 200 hits, doing it for the first time in 2003 and the last time in 2011. From 2003 to 2011, only Ichiro Suzuki had more hits, played in more games and had more at-bats than Young. Young became the second Texas player to win a batting title in 2005 when he hit .331. He also led the majors in hits that year with 221. Young hit at least .300 seven times and recorded his 2,000th career hit Aug. 7, 2011. 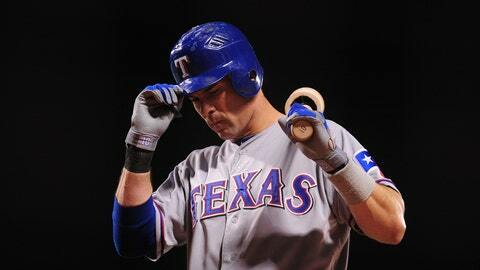 Young began his career as a second baseman, won a Gold Glove at shortstop and ended his playing career with the Rangers as a super utility player, starting at each of the four infield positions in both 2011 and 2012. "He played every position on the field and most roles off it too," Texas general manager Jon Daniels said. "Was the constant through our rebuild. Welcomed in new players, even when in some cases their acquisition or promotion had a personal impact for him. Performed at a high level for the best teams in the history of this franchise. Answered the bell every day and answered media questions every night. Congrats to Michael on an outstanding career and the courage to go out on his own terms." Young asked to be traded before the 2009 season when he was moved to third base to make room for Elvis Andrus at shortstop. He asked to be traded again before the 2011 season when the team signed Adrian Beltre to play third. Young didn’t let that impact how he played on the field or how he was looked upon in the clubhouse. "He was a great teammate and a great role model to me," Texas pitcher Derek Holland said. "I learned a lot both on and off the field and really loved the way he went about his business and competed every day. He was an awesome teammate and an awesome person." According to Foxsports.com’s Ken Rosenthal, Young could have played with the Dodgers this year. Texas general manager Jon Daniels was asked Saturday if the Rangers had interest in Young as a utility player but said the club was going to look internally to fill that role. Young still lives in Dallas with his wife Cristina Barbosa and their three sons.